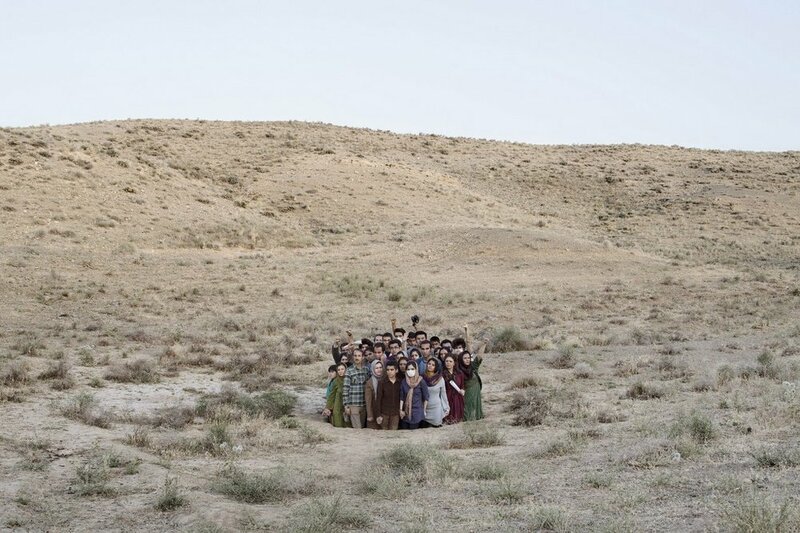 In her most recent series of photographs, Gohar Dashti has presented a counter-narrative of her homeland, in both form and substance. She began “composing” images with Today’s Life and War (2008) and has continued on the same path with Slow Decay (2010) and Volcano (2012). In these three series, she has tried to weave a narrative onto the backdrop upon which the central image of the photograph is depicted; but it is a narrative that gently fades. In Iran, Untitled, there is a sense of unity of place, which fosters the emerging narrative—the title of the series itself develops an even deeper narrative—but here is a place that has lost its locality. It is a desert in the middle of nowhere. Any form of narrative tends to find expression in language. 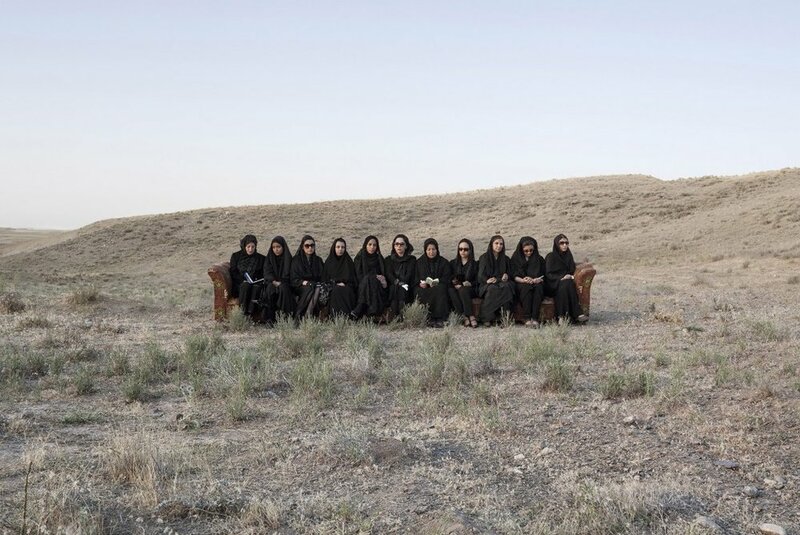 In Dashti’s Iran, however, the relationship between people is not one of language but one of the body. A group of people in a ditch quietly raise their hands in objection. Another group celebrates a wedding on a carpet that is not a flying carpet. A group of alienated women mourn silently. Young people lie on a mattress, waiting for something to happen. Others seem trapped on a slide. A group, younger still, sits in tub, perhaps waiting to be cleansed by the sunlight. A gathering seems ready for a journey. They look prepared but not hopeful. 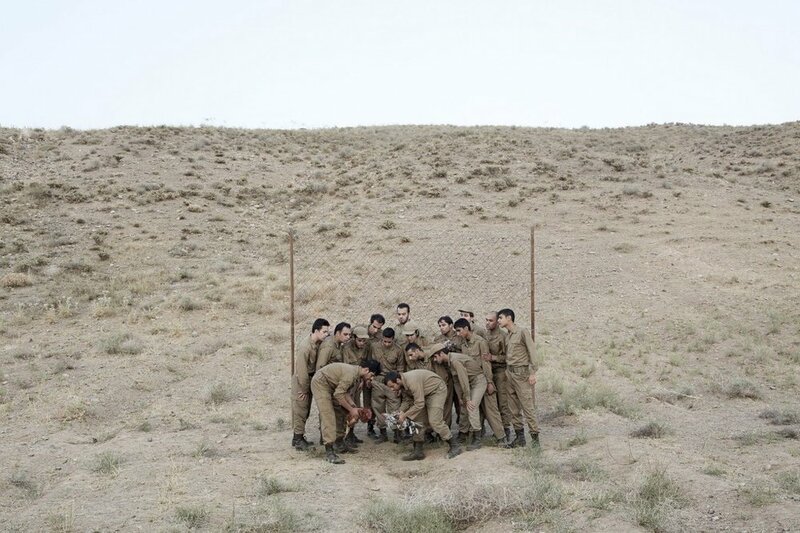 Soldiers play war-games on the edge of the border-less. The photographer has sprinkled the soil of the land upon the surface of the desert. The horizon on this vast desert slowly flexes up and down, providing air to the people. Dashti has cast such scenes in the midst of this open desert and has fixed her own imagination upon the ground. It is as if her imagination is also snapshots of the realities of her country. The snapshots are released in bundles upon the vastness, they don’t recite stories, they whisper. The heart of the matter lies outside this contraction and that dilation. We do not see the story; we are suspended in it so that we ourselves can make the story. I do not know if Dashti’s photographs give us clues with which to construct the story or if they lead us astray. Dashti’s “desert” is not desolate, nor is our homeland.